What kinds of maintenance do heating and air conditioning systems need? The most important part of HVAC maintenance is maintaining unrestricted air flows. Dirt, dust, and debris are an HVAC system’s worst enemy. Whether it’sand indoor or outdoor unit, you must keep the filters clean. As well as keep the heat exchangers and coils free of restrictions. If you need help with this, don’t forgo it — contact a local, Jacksonville AC company for help. How often should I have maintenance performed on my HVAC system? We recommend that you’re heating and cooling system be checked and serviced twice a year — ideally a spring and fall tune up. Als,o we recommend that you change your filter regularly, depending on the type of filter you have. This alone can eliminate many of the most common problems that need repairing and can significantly reduce the likelihood of a serious breakdown. A Priority Customer Agreement or PCA is your assurance that these maintenance needs are met regularly and that any potential problems are promptly identified. Why do I need to replace my air filter regularly? Regular filter replacement helps your heating and cooling system operate at peak levels and improves indoor air quality. It is important to change filters regularly to ensure proper air flow and to keep your home free from dust, allergens and germs — especially if you have pets. Depending on the type of filter you have, you may require filter changes as often as each month. Your Howard Services service or installation technician will recommend the ideal filters and replacement schedules for your system(s). In general, Howard Services Air Conditioning recommends that you replace your disposable filters as least once a month. If you have washable filters, they should be cleaned once a month. 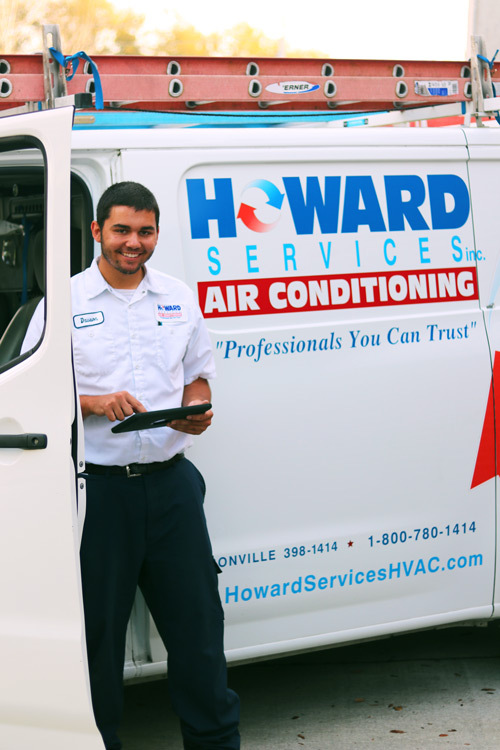 Your Howard Services Air Conditioning technician will recommend a replacement schedule that delivers the optimum efficiency and filtration for your specific system(s). With a Howard Services Air Conditioning Priority Customer Agreement or PCA, we clean and inspect your HVAC system twice a year. Part of the service includes changing the filters or servicing your filtering system (customer provided). Unless you have special circumstances, the services provided by our AC company should be more adequate. We recommend that you visually check filters and filtering equipment monthly. If filters look dirty, they need to be cleaned or replaced. Keep ground mounted outdoor units clear of debris, clutter and weeds — they can reduce the airflow to the unit. Use caution with weed trimmers around the outdoor unit to prevent damaging the control wiring. Keep pets away from the unit — pet urine can cause expensive damage. Check to be sure the air conditioning system is turned on. Check the breakers and disconnects to be sure they’re on or in the on position. Be sure the thermostat is on and is calling for cooling or heating. Also, make a note of any strange noises or smells. Is it making strange noises? Is it cooling or heating all areas of your home sufficiently? Has it been taking longer to cool down or heat up? Have your utility bills been rising for no apparent reason? All of these are signs that you may have a problem that requires the services of a professional AC company. In most cases, the longer you delay, the worse any underlying problems will get, so be sure to contact Howard Services to check your system whenever you notice anything out of the ordinary. How important is it to get the right size heating and cooling equipment? Sizing HVAC equipment is very important from the standpoints of both comfort and energy use. Heating and cooling equipment that are oversized will not run as frequently and when it does run it will not run for long. In both cases, this may mean poor or no humidity control. It could also result in temperature variations or noticeable cycling. Oversized equipment will not be as energy efficient as properly matched equipment either. On the other hand, equipment that is under sized will obviously result in loss of comfort during temperature extremes. During the winter, my heat pump delivers warm air — but not hot air — and will operate for long periods of time. Is that normal? Yes, this is normal. A heat pump generally produces air that is around 80 to 85 degrees and provides even comfortable, heating around the house – not a blast of intense heat. However, 80 to 85 degrees may feel cool to your hand, which is usually closer to 95 to 98 degrees. Several factors that can cause system freezing. First, if running in the cooling mode, check your filters — restrictions in air flow can lead to freezing. Next, thaw the system out by turning off the cooling and running the fan. Also, try turning the system to the heat mode until the ice has melted. 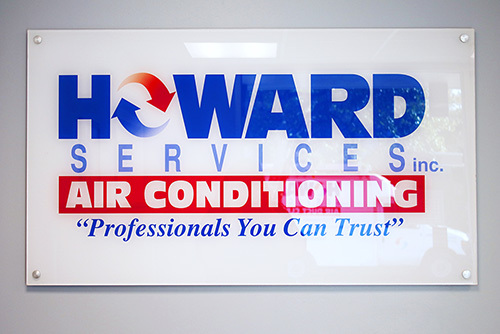 If the problem recurs after checking for air restrictions and thawing your system, schedule a service call with Howard Services Air Conditioning. Our service technicians will check the refrigerant level. They may also have to clean the evaporator coil, check the blower speed, and check for any intermittency in blower operation. A service technician can also evaluate other conditions that may make your system prone to freezing and recommend the best course of action.